HP High Volume, Billet Fuel Filter with 100-micron Stainless element. Designed for inlet filtration of the new, Aeromotive HP Marine Fuel Pump P/N 11110. Fitted with –12 AN O-Ring Boss inlet and outlet ports and a cleanable, 100-micron stainless steel element. This filter can be coupled directly to the pump inlet, preventing debris from damaging your Aeromotive Fuel Pump, with virtually zero flow restriction. HP High Volume, Billet Fuel Filter with 10-micron fabric element. Designed for outlet filtration of the new, Aeromotive Marine HP Fuel Pump P/N 11110. Fitted with –12 AN O-Ring Boss inlet and outlet ports and a replaceable 10-micron fabric element. This filter can be coupled directly to the pump outlet, preventing debris from damaging your EFI fuel injectors, with minimum flow restriction. HP Extreme Duty, Billet Fuel Filter with 100-micron Stainless element. Designed for inlet filtration of the new, Aeromotive HP Marine Fuel Pump P/N 11108. Fitted with –10 AN O-ring inlet and outlet ports and a cleanable, 100-micron stainless steel element. This filter can be coupled directly to the pump inlet, preventing debris from damaging your Aeromotive Fuel Pump, with virtually zero flow restriction. HP Extreme Duty, Billet Fuel Filter with 10-micron fabric element. Designed for outlet filtration of the new, Aeromotive Marine HP Fuel Pump P/N 11108. 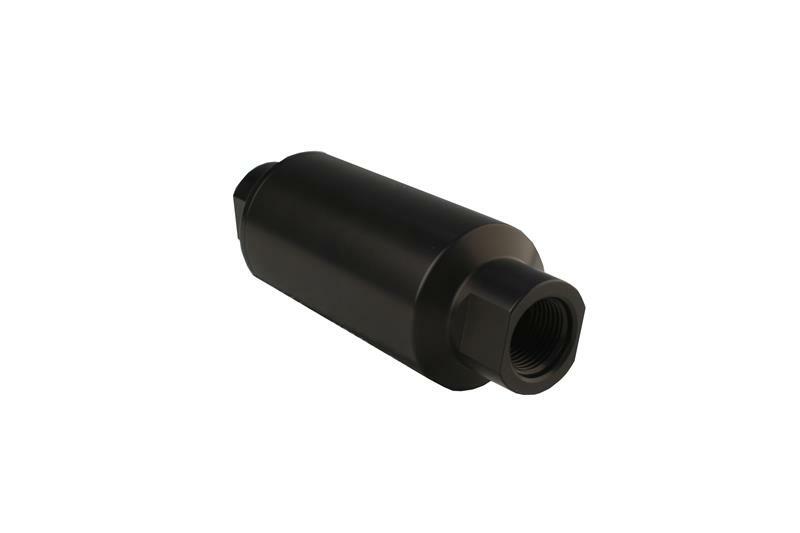 Fitted with –10 AN O-ring inlet and outlet ports and a replaceable 10-micron fabric element. This filter can be coupled directly to the pump outlet, preventing debris from damaging your carburetor of fuel injectors, with minimum flow restriction.